One of the booths in this tea expo belonged to Long Bean Terminal. Yes, the owner calls himself 'long bean' and he is an extremely cheerful new friend I made while at the tea expo. Long Bean is the distributor of 'Fu Lu Yuan' pu erh tea. This tea is made by Deng Shi Hai, who is regarded as a pu erh tea master. 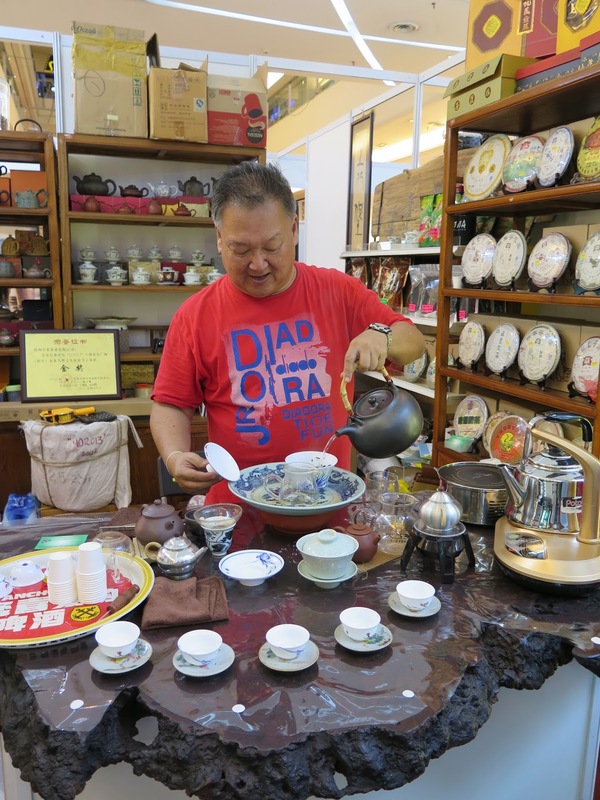 Mr Deng, now residing in Taiwan, had produced a series of pu erh tea and you can see some of his products in the 1st 3 pix. Long Bean treated us to the 2007 edition. Did you noticed the hario kettle used in the 4th pix? At the Xiaguan booth, I got to try their new puerh labelled as 'yuan ye' translated as original leaf. The Xiaguan manager told me that this pu erh tea was harvested from wild trees. Note the larger leaves in the pix. I thought I saw a couple of huang piang in the cake. Slightly bitter but nice. The gentleman brewing tea, in the red tee, is also a new friend made at the tea expo. Michael is the owner of Vintage Kei Tsui Marketing, and he brewed the 2007 Dayi raw 'secret/special' aroma cake for my tea drinking group. Notice the tea tray used for brewing tea. Michael also showed us a tea tray for sale (see last 2 pix). Click the picture for a larger view. It looked like a vintage footed porcelain plate. About a foot in length, this plate had been modified into a tea tray. A hole was drilled through the middle and a copper attachment was attached at the bottom, where you can run a plastic tube under the plate, through another cut up groove at the base, and use this porcelain piece as a brewing tea tray. Quite ingenious but Chinese porcelain collectors will be mortified at such modifications made to this vintage piece. I had just returned from my weekend trip to Kuala Lumpur (KL), Malaysia. 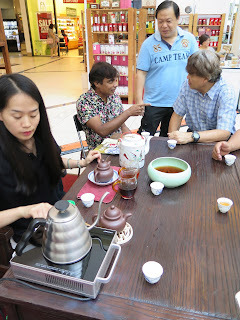 I spent some time visiting the tea expo there together with my Malaysian tea buddy group. I was also invited to view my friend's tea collection that was supposedly the largest Dayi collection of any single collector. More on that later. This year's tea expo was held at Tropicana Mall that started from 20 through 29 May. 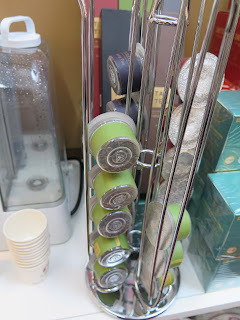 There were about 50 booths where pu erh, oolongs, liu bao and tea ware were the main products that was offered by most of the participants there. I was also fortunate enough to snagged some tea (specially priced) for early visitors that were present on the 1st day of the tea expo. 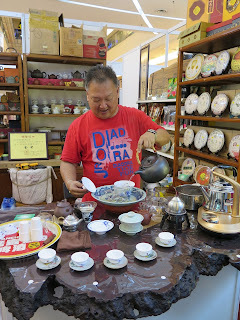 I got a couple tins of 2007 Sea Dyke's Ming Xiang oolongs, specially commissioned Xiaguan tuos for the tea expo and a teapot……and later 5 more kilos of pu erh (teashop hopping in the late afternoon) to complete my trip. The Xiaguan tuos are the 'Long Ma' edition pu erh that was specially made for the Malaysia market. The tea expo was vibrant with many visitors. Perhaps the public holiday on that weekend (Vesak Day) drew out more visitors to the malls as well. Looking at the pretty crowded booths, I guessed the organizers would be satisfied with the crowd turn out in this tea expo. A visit to the Dayi booth sprang some surprises as well. Dayi introduced a tea brewing machine (see final 2 pix). It works like a coffee machine. Select your tea capsule and insert the capsule in the machine. The machine will 'sense' the tea and make adjustments to the brewing parameters like temperature of water and brewing time. Place your mug on the dispenser tray and your tea will be ready in no time. 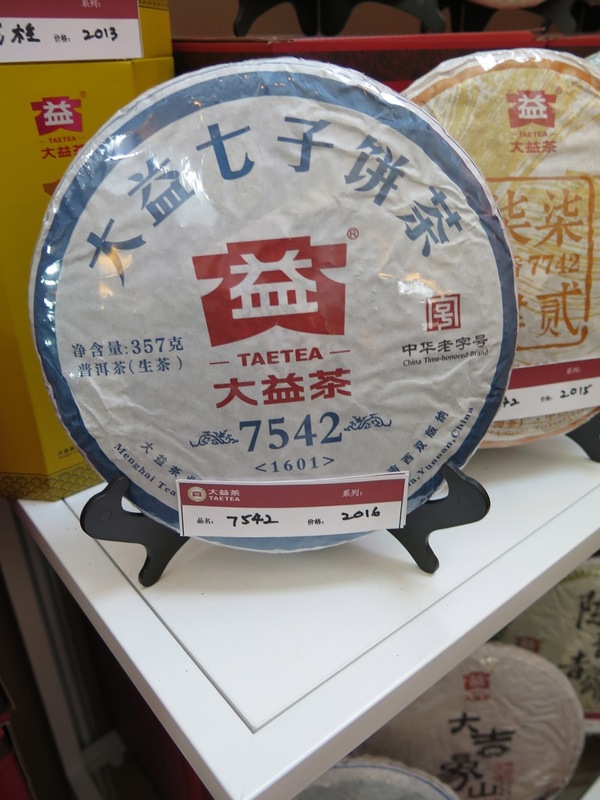 I also noted that their flagship raw pu erh 7542 had reverted back to their traditional style wrapping that were commonly seen pre 2013. My Dayi tea friends and I noticed that recent productions of the 7542 seems more floral and lighter in taste. The recent years' 7542 tasted different, compared to pre 2013. Maybe our tastebuds are not very good. I had included this pu erh cake in one of my online orders more than 6 years ago. This is a ripe pu erh cake 357g and manufactured by Yong Pin Hao tea factory. I believed I had made this purchase due to the pretty printed wrapper on the cake. I would recommend that if you are drinking pu erh tea, that you break up your pu erh tea cake or tea brick into smaller pieces of about the size of either nickel or quarter coins. Breaking up your tea cake or brick, will allow your tea to 'breathe and awaken your tea" This procedure is called 'xin cha' in Chinese, which will make your tea more aromatic and tasty. I recommend that you put your broken up tea pieces into a porcelain container. If you are using a glass container, use the pu erh wrapper to line the inside of your glass container as not to expose your tea to light. I recommend you let your tea to breathe for a week before you start brewing the tea. There is a clear and distinct difference when you have 'awaken' your tea, in terms of aroma and taste. I sound like a broken record as I had encouraged my readers, on many occasions in my blog, to break up their tea and place the tea in a tea caddy. I have tea collector friends that just keep a tea cake in its wrapper and breaking off a small chunk whenever they want to brew the tea…..and I have persuaded a few friends to break up half the cake and keep the other half in the wrapper and test the tea over time. I am happy to say that they now 'awake' their tea in tea caddies. There is a catch… in that you need to have, or buy tea caddies and you need storage space for the caddies. I broke up a small chunk of this tea to brew when I opened the wrapper and broke up the rest of the cake into a tea caddy. The initial chunk when brewed, tasted very mild and bland. However, when I revisited this tea a month later, there was a pronounced change in this tea. The brew was more aromatic and this tea displayed a creamy-like sweet finish. I could get 8 good infusions of this tea. Quite nice actually. Welcome to the 2106 royal rumble. This year's event is a teapot edition where 3 teapots will enter the ring (aka tea tray) and will try to outmuscle each other to see which teapot makes the nicest tea. Let me introduce the 3 teapots. Notice they are approximately the same size (about 160ml capacity) and with similar round and shapely figures. The 1st teapot (pix 3) is from Taiwan, manufactured by Lin Ceramics and made with purion clay. This teapot had made an impact in the Chinese tea world as many tea drinkers have found that brewing tea with these teapots enhance the taste of the tea. The 2nd tea (pix 4/5) pot comes from Japan and is made from Bizen clay. Traditional Bizen clay products are unique in that during the firing (baking) process of the bizen ware, ashes are allowed to 'fly' within the kiln and as a result, some ash were embedded onto the bizen ware producing a fascinating finish that looked almost 'extra-terrestial' in appearance. I was told that tea brewed using bizen clay make the tea more soft. The 3rd teapot (pix 6) comes from China. Made from Yixing Clay. This teapot was recently made (2012) and was given to me by a friend who enjoys making teapots as a hobby. Yixing clay is regarded as the best clay suitable for tea brewing by the Chinese tea brewing community. Antique Yixing teapots or those made by famous potters fetch a very high price in the secondary teapot market. 2 teas will be used in this contest. They are 2004 Xiaguan mushroom raw pu erh and my last chunk of a 2010 Haiwan 5-year ripe brick. I will weigh out 7g of tea for each teapot, 2 flash rinses and the tea will be assessed from 2nd to 5th infusion in one sitting. a) Brewing tea in such teapots will leave a patina on the inside of the teapot. Patina here seem to suggest a tea coating, like paint being 'brushed' onto the wall on the teapot. 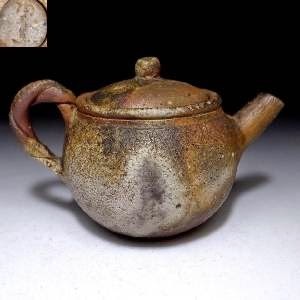 With regular use of a teapot, this tea patina will develop on the inner surface of the teapot and this patina will amplify the tea being brewed in the teapot. This is the reason teapot users encourage that you dedicate a teapot for a certain tea, meaning if you drink Shui Hsien, ripe pu erh and white tea, you should have a teapot dedicated to each of these tea, which implies that you should have 3 teapots, one teapot per tea. b) The firing of the clay. This gets a little technical. Firing refers to the baking of the clay to remove the moisture in the clay and 'hardening' of the clay. 2 factors can be controlled and they are heat (how hot) and time (how long the clay is fired). Chinese teapot users I know claimed that high fired clay are good for traditional oolongs while low fired clay suits pu erh well. c) The degree of 'porous-ness' in the clay. There are claims that the more porous clay make the tea more smooth while the less porous clay makes the tea more pronounced in taste. It was mind boggling when I typed out these 3 arguments. 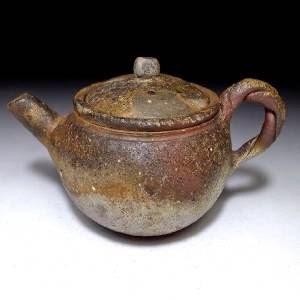 Yes, these factors would play a part to explain why tea taste different with clay teapots. But, we are talking about 5 seconds, maybe 40 seconds max when you brew Chinese tea (kungfu style), in a teapot. Does this short time of 5,20 or 40 seconds made the tea inside the teapot, to taste differently? Have tea drinkers considered the 4th possibility that there is a genie in the teapot that magically affected your tea? I would humbly like to suggest one more argument in addition to the reasons above. It is temperature. Try a simple experiment. Brew tea into 3 teacups. Drink 1st cup immediately, 2nd 5 minutes later and the 3rd half hour later. The same tea will taste different with each cup. I am suggesting that certain clays hold the temperature of your tea well and some clays do not hold heat well. The temperature of the water used will also affect your tea as well. There are many examples of food and drink where temperature plays an important part. Examples would be cold beer, warm bread, ice cold soda and piping hot soup. I am suggesting as a tea drinker, you can 'taste the difference' from a cup of tea from another cup even if there is a small change in temperature, and yes... even a few degrees difference in heat. A cup of tea would vary in taste at different temperatures. It is my opinion that it may be a combination of these factors I have listed, including the genie, that made an impact on your tea. Back to the royal rumble. Who won? Ripe pu erh tasted very good in purion. Yixing was very good too (superb for oolongs in another mini rumble I held a couple of months ago). Looking and brewing with bizen is like sitting on a magic carpet. I think I am tea drunk! Since this is a long Labour Day weekend, one more round of tea, please!